Phobos (pronounced FOH bus) is the largest of the two moons which orbit the planet Mars. It is also closer to it’s primary than any other satellite in the solar system. Phobos travels only 3,700 miles (6,000 km) above the surface of the red planet – by comparison the Moon is 384,400 km above Earth. Phobos orbits Mars three times per day and because of it’s proximity to Mars, astronomers weren’t able to see the moon until the 19th century when it was discovered by American astronomer Asaph Hall on August 18, 1877, 6 days after he discovered the moon Deimos. Phobos orbits closer to its Primary (Mars) than another other moon in the solar system. The moon travels around 6,000 km above the surface of Mars. That’s around 3,700 mi and it’s one of the reasons why it took so longer to discover it. In Greek mythology, Phobos is the son of Ares, the god of war and he is the personification of fear. He was known to join his father in battle along with his twin brother Deimos – the name of Mars’ other moon. Phobos moves across the sky of Mars twice a day. It takes Phobos 4 hours and 15 minutes to move across the sky of Mars because of how close it is to the planet. The moon rises in the west, moves rapidly across the sky, and sets in the east twice every Martian day (every 11 h 6 min). This is because it orbits Mars below the synchronous orbit radius – this means it moves around Mars faster than Mars moves itself. Phobos is made up of the same matter as asteroids and dwarf planets, composed mostly of material similar to Type I or II carbonaceous chondrites. It’s density is too light to be solid rock and it is one of the least reflective objects in the solar system. Scientists don’t believe Phobos came from the asteroid belt, despite it’s similarities to asteroids. This is because of it’s circular orbit path, which would be unusual for an object captured by a planet’s gravitational pull. Also, it is much less dense than other objects in the belt. Instead, it is thought that Phobos and Deimos either formed from dust and rock drawn together by gravity, or from a large impact collision which broke away pieces of Mars than then formed it’s two moons. 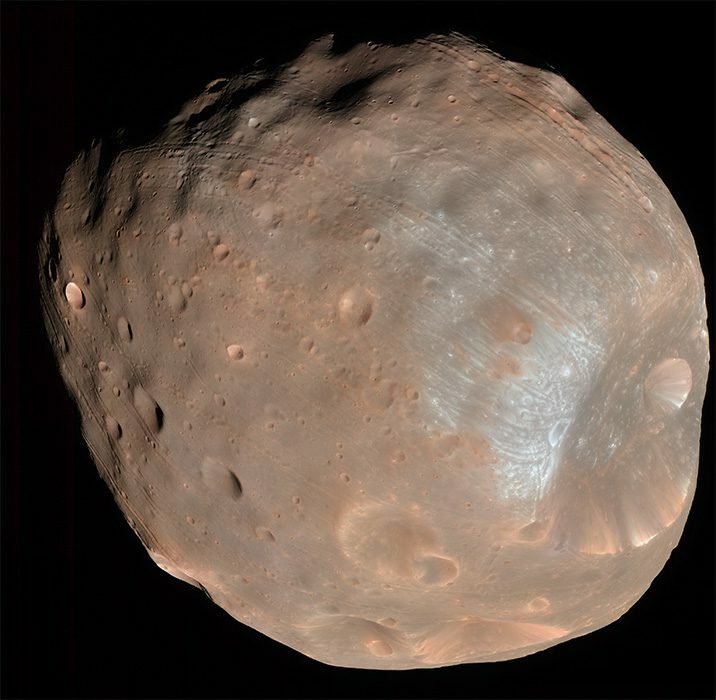 In 50 million years Phobos will collide with Mars. Due to tidal deceleration caused by Phobos orbiting Mars below the synchronous orbit radius, tidal bulges are decelerating Phobos’ orbit and it will gradually spiral closer to Mars. In 30-50 million years, Phobos will be destroyed – either by colliding with Mars or torn into rubble and scattered as a ring around Mars. The moon is spiralling inward at about 1.8 centimeters per year, or 1.8 meters (6 feet) each century. Phobos has an impact crater which is 9 km (5.4 mi) wide. The largest crater on Phobos is 9 km wide and covered a large portion of the moon’s surface. The crater is called Stickney and named after Chloe Angeline Stickney Hall, the wife of Asaph Hall and discoverer of Phobos, in 1973. It is believed that the impact that created Stickney must have nearly shattered Phobos. Temperatures on Phobos are around −4°C (25°F) on the sunlit side of the moon, down to around −112°C (−170°F) on the shadowed side. Some prominent scientists once thought Phobos may have been created by Martians. This is because of the small size of the moon and its very weak gravity. In 1971, the Mariner 9 became the first manmade satellite to ever orbit another planet and sent back many images of both Phobos and Deimos. These photos showed both objects to be lumpy, and odd-shaped rather than spherical like most moons. Phobos was also photographed by the Viking 1 in 1977 and Phobos in 1988. NASA is also considering a Phobos Surveyor mission which would send small probes to the moon’s surface. NASA has considered using Phobos and Deimos as space stations to observe Mars in closer detail. A landing on the low gravity moon would also be much easier than landing on the surface of Mars and could be used to test new technologies before attempting a Mars mission.